Caffyn Bros have a good display of fowl and meat for sale. I doubt whether this display would be permitted today under hygiene rules particularly with hundreds of cars passing by daily. Fortunately, almost one hundred years later a butcher’s shop still operates at this site. This photo was taken in 1905 when William Field acquired the premises known as Windy Hills. The Caffyn brother involved in running the butcher's business was bought out in 1908 by Mr Field when Caffyn wanted to "go and have a dabble in motor cars". Henry Field took over the business, while his father remained at the Turners Hill shop. Henry Field continued at Windy Hills until the early 1950s and then rented the premises to subsequent butchers. The property remained in the family until 2005. Jennifer, I have changed the date from 1920 to 1905. Of course, this means that a butchers shop has been on the site for well over 100 years! I was asked to lower the shop window cill for better viewing from the road. Cutting away underneath exposed the original sash window still slid down into the cellar. I had fun lowering the glass down to new lower cill! Fitted louvres above. I have now found another copy of the photograph with more clarity and have uploaded it above. I have also zoomed in on the men and carcases and this can be viewed by clicking on Large Version. Note the wooden trays for carrying the meat. Please can anyone name those in the above photograph? My father, Pat Manthorpe, had this picture framed and hanging in the shop. He struck the exact same pose with his employees one Christmas with all the turkeys hanging up outside, and that picture took pride of place directly under this one. Must see if I can find it. I have tried to identify those appearing in the photograph, but with little success. Using the search facility I have found a picture of a Thomas Caffyn in a photograph of Handcross cricket club in 1892. (See picture #914). However, he would be too old to be one of those in the above picture. He owned a grocery and drapery shop in Handcross. The 1901 census has the butcher’s shop being operated by Stephen Fowler (60), his wife, Eliza (57), and their son, Richard (34). Next door in Shearlock’s newsagent shop lived the son, George Shearlock (26), who was described as a “butcher” and perhaps he worked in the shop and appears in the photograph. The 1911 census shows William and Esther Field, and their children, Henry and Ethel, all of whom are described as working in the butcher’s shop. 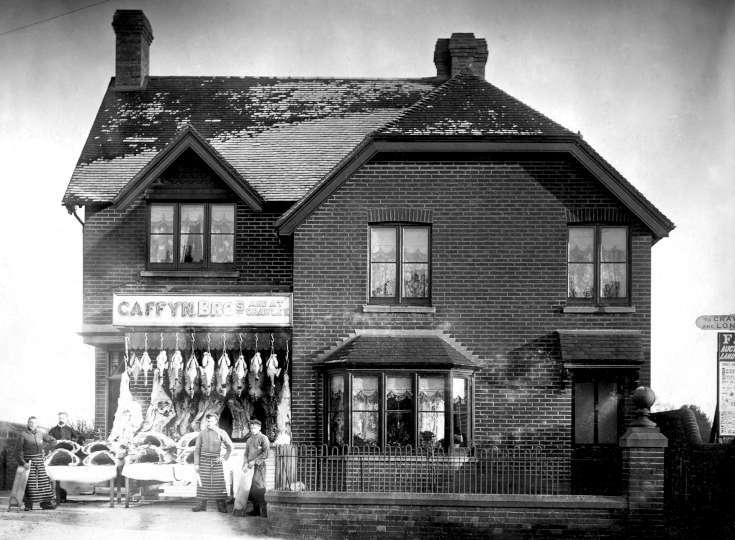 One can only conclude that the Caffyn family operated the butcher’s shop for just a short period sometime between 1901 and 1908. Perhaps the lure of the new mechanised vehicles appearing on the roads was too much!